Also serving communities of Palmer. There are 10 Assisted Living Facilities in the Wasilla area, with 4 in Wasilla and 6 nearby. To help you with your search, browse the 7 reviews below for assisted living facilities in Wasilla. On average, consumers rate assisted living in Wasilla 5.0 out of 5 stars. Caring.com has helped thousands of families find high-quality senior care. To speak with one of our Family Advisors about assisted living options and costs in Wasilla, call (855) 863-8283. Wasilla, Alaska, located on the northern point of Cook Inlet in the Matanuska-Susitna Valley, has a rich history steeped in the Gold Rush. It is also the largest city in Lake Country; its glass-top lakes invite seniors to fish, float or relax in a serene environment. There are also four assisted living facilities in Wasilla with six more in nearby Anchorage. They're all licensed by the Alaska Department of Health and Social Services and regulated through annual inspections. Some offer only assisted living options where staff help with personal care and medication administration but others include independent living where residents take care of their daily tasks and still have assistance nearby. Alaska is known for cold weather and plenty of snow. Wasilla gets about 53 inches of snow a year. That’s more than double the national average of 26 inches. While winters are cold with temperatures in the single digits, summers are cool with average temperatures in the upper 60s. Wasilla has a cost of living 18 percent higher than national average. This higher cost is mostly contributed to health care premiums that can reach hundreds of dollars a month. Because health care is important to seniors, this could become a problem. Alaska doesn’t tax social security checks. Wasilla only has a 3 percent sales tax for the town, and state and county sales tax is 0 percent. These benefits help keep hard-earned money in your pocket. Wasilla has a high crime rate. On a scale of 100 being the safest and 0 the most dangerous, Wasilla has a rate of 4. The most crimes are property related, such as theft of personal goods or cars. This could be dangerous for seniors, but some facilities offer additional protection including emergency response systems and enclosed garages. Wasilla has an emergency facility in town at Mat-Su Regional Urgent Care. The nearest hospital, Mat-Su Regional Medical Center, is 12 miles away by car, in the event of medical emergencies or illness. Wasilla Area Seniors, Inc. Is a non-profit organization dedicated to keeping seniors independent. The center offers different events and programs for anyone living in the area. Assisted Living costs in Wasilla start around $0 per month on average, while the nationwide average cost of assisted living is $4,000 per month, according to the latest figures from Genworth’s Cost of Care Survey. It’s important to note that assisted living rates in Wasilla and the surrounding suburbs can vary widely based on factors such as location, the level of care needed, apartment size and the types of amenities offered at each community. 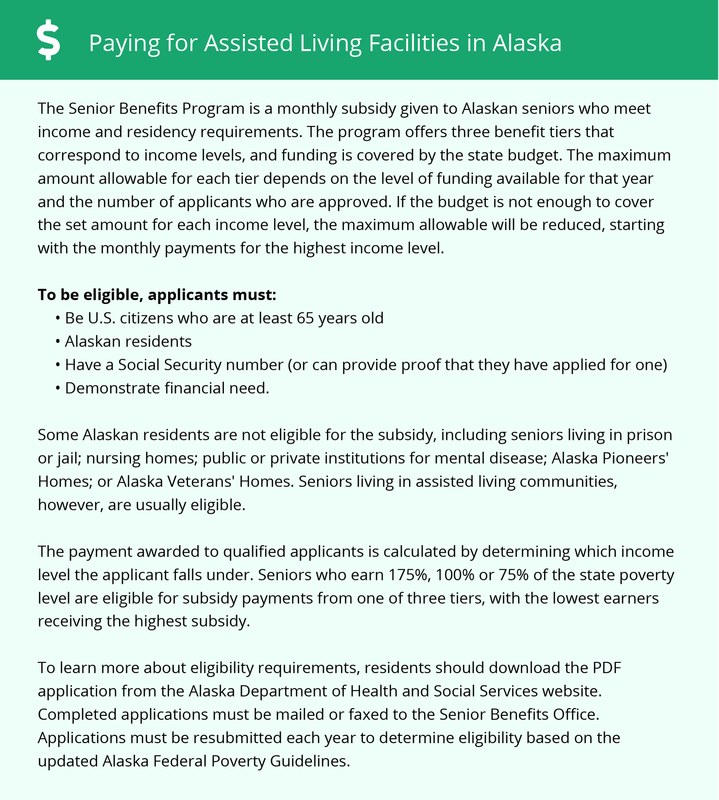 Eligible seniors in Wasilla can pay for assisted living costs using state Medicaid options. Wasilla and the surrounding area are home to numerous government agencies and non-profit organizations offering help for seniors searching for or currently residing in an assisted living community. These organizations can also provide assistance in a number of other eldercare services such as geriatric care management, elder law advice, estate planning, finding home care and health and wellness programs. To see a list of free assisted living resources in Wasilla, please visit our Assisted Living in Alaska page. Wasilla-area assisted living communities must adhere to the comprehensive set of state laws and regulations that all assisted living communities in Alaska are required to follow. Visit our Assisted Living in Alaska page for more information about these laws.